You will never think about fruitcakes the same after this, you’ll always have a birthday treat to please crowds of all ages and you’ll have a date night cake that will make you look like a baking pro. But don’t think that unique equals difficult, sometimes the easiest way is the best way and each of these fits that. Two of the recipes use box cake mixes, giving us more time to spend with the ones we love. There is so much pressure to have perfect birthday cakes for your little ones, but worry no more, we’ve solved the problem. Strawberry piglet cupcakes are sure to win over any crowd and make you look like you spent way more time on them than you actually did. Jumbo and mini marshmallows give the little pig faces lots of character, and this recipe is super easy and something fun to do with the kids — maybe they can make their own birthday treat this year! Mix cake batter according to package directions. Fill 18 standard muffin tins evenly with batter and bake until cake tester inserted in center comes out clean, about 23 to 28 minutes. Cool completely. Spread with frosting. Pipe black dots on white sprinkles to make eyes, let stand 20 minutes to dry. Using skewer, make 2 indentations in marshmallow halves to make nostrils. Top each cupcake with marshmallow half for the nose. Add eyes. Cut mini marshmallows in half using kitchen shears to make ears, and secure in frosting. A fruitcake? Really? Yes. We took the old, dense, easy-to-make-fun-of bread filled with gummy fruit and we reinvented it. This is fruitcake like you’ve never met before. 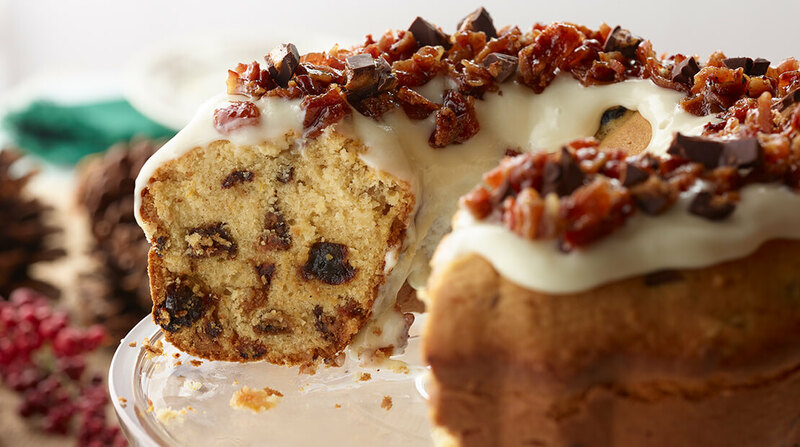 We probably shouldn’t even call it fruitcake, we should call it cinnamon-bacon-chocolate-deliciousness cake. This is definitely one that you can’t knock until you try it, and once you try it you’ll be making it for every winter gathering here on out. Heat oven to 350°F. In medium bowl, combine raisins and next 6 ingredients; cover and let stand 30 minutes. In mixing bowl of stand mixer, using paddle attachment, add butter and beat at medium speed for 1 minute. Gradually add sugar and beat until light and fluffy. Add eggs, one at a time, beating after each addition. In medium bowl, combine flour and next 5 ingredients. Add flour mixture to butter mixture alternatively with raisin mixture, starting and ending with flour mixture, just until blended. Stir in chopped peanut butter cups. Bake 1 hour and 5 minutes or until cake tester comes out clean when inserted into center of cake. Let stand 10 minutes. Turn cake out onto cake plate and let cool completely. Spoon cream cheese glaze over cake and top with candied bacon and peanut butter cups. In large bowl, using an electric mixer, combine cream cheese, powdered sugar, vanilla extract and milk until smooth. Heat oven to 350° F. In shallow plate, stir together brown sugar and cinnamon. Dredge bacon slices in sugar mixture, pressing to adhere. Place slices on lightly greased wire rack, side by side, over a jellyroll pan. Bake 45 to 50 minutes or until crisp. Let cool completely and finely chop. 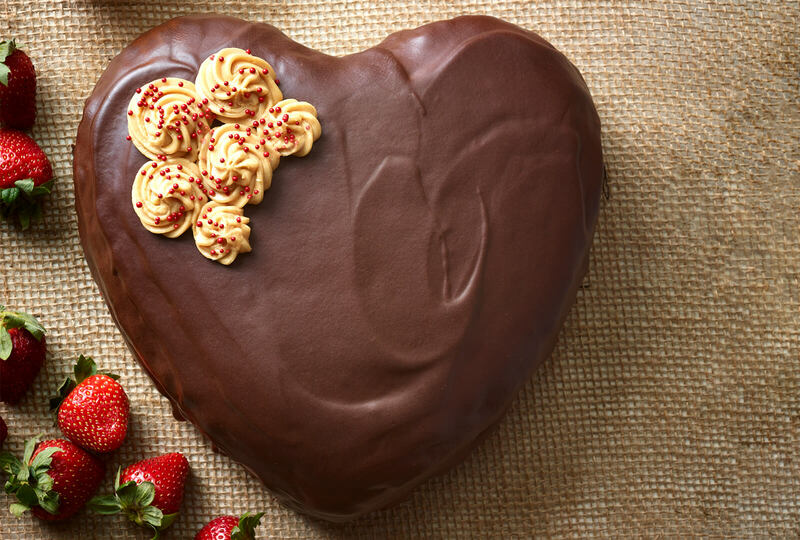 With a nod to Valentine’s Day, we ordered a nine-inch heart-shaped cake pan online. The six-ingredient peanut butter mousse only uses one bowl and takes about five minutes to throw together. We added a little more frosting to decorate, but mini chocolate chips, sprinkles, powdered sugar or whipped cream would also work. You can even switch up your decorations for the occasion — Valentine’s Day, anniversary, date night or any night. Heat oven to 350° F. Mix batter according to package directions, adding 2 tablespoons instant espresso powder to ingredients in mixing bowl. 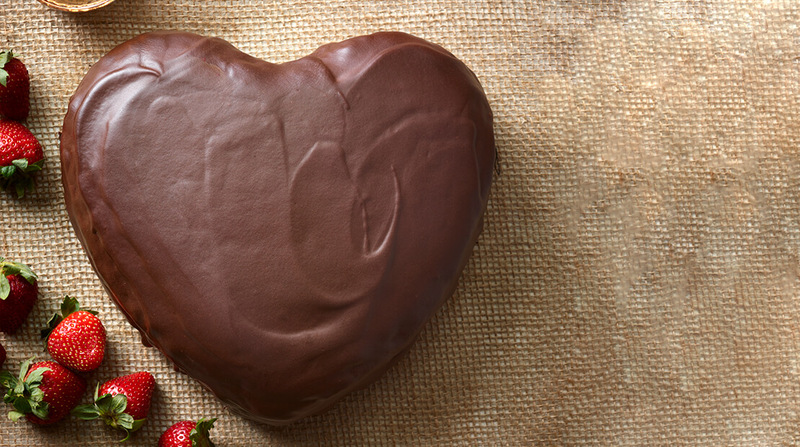 Pour batter into lightly greased 9-inch heart-shaped baking pan. Bake 40 to 45 minutes or until cake tester inserted in center of cake comes out clean. Let stand 10 minutes; remove from cake pan and let stand on baking rack until completely cooled. Trim top of cake with serrated knife to level. Cut cake in half crosswise. Spread peanut butter mousse over bottom layer, leaving a 1/4-inch border. Top with remaining cake layer. Spread chocolate ganache evenly over cake. Decorate as you please. In large bowl, using an electric mixer, combine peanut butter, cream cheese, powdered sugar, whipping cream, vanilla extract and kosher salt until smooth. Heat whipping cream in microwave on high for 1 to 2 minutes or until heated through. Pour hot cream over chocolate morsels and let stand 2 minutes. Whisk until smooth. Stir in vanilla extract and salt. Let stand 30 minutes, stirring occasionally. This article was featured in Issue V of Inside Hormel Foods magazine. Click here to explore these unique collections of thought-provoking and heartwarming stories, recipes and features on our employees and the different areas of our company, all packaged up in a beautifully designed digital viewer for you.